When roadschooling (homeschooling on the road, if you haven't heard), it's important to find a curriculum that is highly portable, lightweight, but still packed with all the important learning tools and information your child needs for a solid education. Here's why we think time4learning.com fits the bill. Whether roadschooling in a rolling home (aka RV) or via the family vehicle, you probably want to save the space for gear. Who wants to lug learning material while hiking in the Rocky Mountains or kayaking the rapids? Not us, that's for sure! We often do some pretty rough terrain hikes and intense climbing and other adventuring. We need more room for food, water, and supplies and don;t really have a place for heavy books. Time4Learning allows us this luxury. Ditch the heavy books for a learning method you can fit in your pocket, if necessary. It Fits In Your Pocket! We love that our kids can do Time4Learning's homeschool curriculum via their phones or tablets, if need be. This really comes in handy when we're using nature or another road-trip-worthy excursion in conjunction with lessons. This way, if the day's lessons involve railroad history, we can easily pull it out on a trip to railroad or museum. Then, it can all be done at the same time, for a more memorable lesson. In the photo above, our son was learning about the first continuous land link by railroad across the U.S. How many books do you see in hand? Why? His cell phone was in his pocket so that he could easily access his lessons, if need be. We all know that kids have that magic time when they learn the best. When you use Time4Learning during roadschooling homeschool field trips, you can either put the lessons or the adventure first. Your child can log on whenever they want - even 3 a.m, if you approve! This allows children to be more relaxed and focused when they log on. A focused child is more likely to learn than one who is forced to learn before ready. What If Your Child Hates Learning? If your child is like one of ours, gaming is everything and learning is boring. Well, at least that was before roadschooling with Time4Learning, anyway. Because the lessons are very interactive, it's like getting a gaming experience, allowing children to actually enjoy the lessons. The added adventures with the roadschooling lifestyle hardly make it seem like school at all. What About an Internet Connection On The Road? Yes, we know that many RVers face this often. However, getting internet access for using Time4Learning on the road isn't as hard as you think. We use a cell phone plan that includes unlimited data for the kids who use Time4Learning. Then, the rest of the phones have the highest data plan that includes WiFi hotspot. This means that if the kids want to do their learning on the computer or tablet, instead of the phone, they can still access their lessons using the WiFi hotspot. If the cell phone solution isn't an affordable option for your family, most cities and towns have libraries. We've never had problems finding one somewhere on the way there or back, if not in the place we're traveling to. Does My Child Actually Learn With Time4Learning? In our experience, most definitely. We have actually tried other forms of online homeschooling and this is the only one that all of the kids liked, regardless of whether it was used in lower or upper grades. It's also the one they've learned the most using. We think this is because of the built-in entertainment factor. When kids enjoy themselves, they pay more attention, thus making it so the lessons actually stick. *Note: The author was compensated for this review. However, the review is 100% honest, based on her own experiences and is in no way influenced by the compensation. Need an honest review? Please Contact Us with info. We only do reviews for products and services that our family actually uses. RV'ing With Babies: 5 Reasons It's Awesome For Them AND You! Living in an RV can actually be a great lifestyle for babies. Wait, what? Here are 5 reasons RV living is awesome for babies! Because living the RV life calls for exploring new places, this also means new people. Social skills are very important for a developing infant. This means it helps establish an outgoing personality early on. Cranky baby who wants a ride? No worries. Your little one can have all the comforts of home because you don't even have to leave home to go on a soothing ride. Gotta love the RV life when you have a baby! The bigger your place is, the easier it is to lose track of what your baby has and where it might be. It's not as much of a problem in an RV because everything has its place, since space is so limited. Plus, even if you do put something out of place, there aren't very many places it could be. The RV life generally comes with a lot of nature. This is important for babies (and their parents, too). By helping to create a love of nature early on, you are helping your baby form a deeper connection with the world around them. I always think it's funny when people wonder if RV living is stable. Babies like familiarity. So, what better way to have adventures than in something familiar? When the place they know most (your RV) is also the same place you take adventures in, you're never away from home. This offers stability and is actually a simpler way to do so than traditional living. Kansas is one of the many states we passed through on our huge RV road trip this past summer. Here are some beautiful photos of a sunset in the hills over a lake in Dorrance, KS. When RV’ing with babies, it’s important to choose gear that is versatile, safe, convenient, and functional. Knowing which cribs work best on the road is important. Here’s why we chose the Graco Travel Lite Crib as the best playard or crib for parents traveling or living in a travel trailer or motorhome. When we decided to try out the Graco Travel Lite Crib, we were already familiar with the Graco brand and had a larger Graco travel playard model. While that model does fit in our RV, we wanted something even smaller and less bulky (while the baby is still small) without losing the convenient features. We didn’t have to hunt much for our Graco Travel Lite Crib, as it showed up at a thrift store just as we decided we needed a smaller bassinet or playard. But they’re actually easy to find. That’s not why we chose it as the best one, however. How Does Our Baby Like the Graco Travel Lite Crib? Of all the various nap and sleep solutions we’ve used, Nova Skye (our baby) has enjoyed the Graco Travel Lite Crib the most. We think it’s the cozy compact design coupled with the extra comfy mattress. She also enjoys the little toys hanging from the mobile on the sunshade. As she grows, she might fit better in the other (bigger) one we have. But for now, we use that one when in bigger spaces or for various other purposes. May as well, since we have it and she enjoys that one, too. You won't believe what this rare 1977 Winnebago looks like inside and out! It's all decked out Denver Broncos style, but still remains true to the 70's. The engine needs a rebuild, but most other things inside are in working order. We're working on getting this vintage beauty into tip-top shape. Take a rare peek at what's going on inside this '77 Minnie Winnie! The dinette that doubles as a bed needed a little work done when we got it as the center piece was missing and one of the benches had a crack in the seat area. I went to Home Depot and got some board for both areas, as well as the necessary hardware, picked up some marine vinyl fabric, and put it together. More about that in a future post. The top bunk is a perfect hideaway and doesn't really need any work done to it. We may eventually replace the mattress there, along with the cushions and mattresses in the other areas. The kitchen doesn't really need much work, as most everything is in working order. I did replace the p-trap in the beginning, as there was a small leak, which is normal in any kitchen, not just RVs. We also will need to replace the water pump. But that's about it. The bathroom doesn't need any help at all. In addition to the toilet and sink pictured, there is a spacious closet with a door, as well as a full tub and shower. When we got the RV, the wood floors came painted blue to match the Broncos theme. However, raw wooden floors are not very livable in an RV. So, we replaced them by installing vinyl tile, which is much easier to clean during adventures. It's also better when you have kids. The picture on the right shows the original floor and the one on the left shows what we did. The picture on the left shows my son on the long bench that is opposite the dinette bench. The picture on the right is the RV refrigerator. It does have an issue staying cold that may or may not be simple. We're working on that too. When we adventure, we do have a system that keeps it cold. So it's not a priority yet. Though, it is on the list of fixes. This is just a small glimpse of everything that's on the inside and what we've been doing. Stay tuned to future posts for even more by hitting the subscribe button on the right. We've been having so much fun at a campground in Strasburg, CO. Outdoor movies are one of the many fun things they do. Here's a couple pics of the kids watching one of the Peter Pan movies this past weekend. We think it's cute that the campground owners let one of the little girls here bring the feature movie that night. They're really good here about making sure everyone is happy and included, especially the kids. When the kids are happy, the parents are happy. We had lots of fun at the campground in Strasburg, CO this past weekend. One of the things we did is a hay ride. This was a first hay ride for Aja, Nathan, and Nova. Rich and I had done them before, but it had been quite some time. Aja, Nathan, and their friends listening to the tractor driver tell a bit of history. Can you believe the tractor that pulled us is from the 1940s? This is Rich and I's feet on the trailer floor as we went for the hay ride. Rich, Nova, and I being silly on the hay ride. I would have gotten Aja and Nathan's expressions, but they were upfront and we were in the back. One of the best things about this campground we've been staying at in Strasburg, Colorado is the fact that they have plenty for the kids to do on weekends. One of the activities is renting bikes (actually pedal powered go-karts) for an hour or so. They aren't the easiest things to ride, but that's part of the beauty of them. 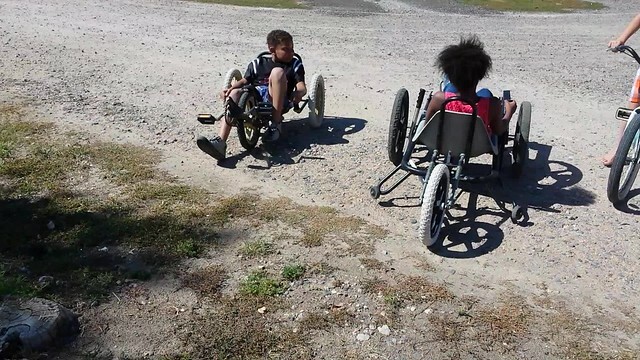 Aja and Nathan had a blast riding the pedal go-kart bikes this past weekend. Just look at them go in the photos and video below! If your RV sink is turned off or broken in some way, there are still several ways to make use of it. Find out which way is right for you, based on how bad your RV sink situation really is. This method is best for those who have a working drain and a grey water tank that is less than ¾ full. If your p-trap is leaking, do not use this method. However, if there are no leaks when your pump is turned off and your grey water drains into the tank properly (and your tank is capped with the release valve closed), you can use this method. Since your RV sink pump will be turned off, you must be either boondocking or you have an issue when the pump is turned on. This means you will need a couple gallons of water. One is for a rinse bucket and the other is for your washing water. You can either buy this water or if you are at an RV park (or other location) with access to water, you can fill up a jug or bucket accordingly. Plug your drain and fill one side of your turned off RV sink with water. Add antibacterial dish soap and swish it around to make it soapy. Add dishes and wash them. Place them in the empty side of the sink and drain the soapy side. If you have a heat source available, you can boil the water first for added disinfecting. Use the rinse jug or bucket to rinse the dishes over the unplugged side of the sink. Again, only do this if your tank can hold both the rinse water, as well as the soapy water. Dry the dishes inside the clean sink, on a dry towel, or in a drying rack. Once you have access to a sewer drain hookup, drain your grey water tank. If you can’t get access to a hookup and you need to drain it, drain it into a bucket, safely handle/store it, and drain the bucket as soon as there is a safe place to do so. This method is best used if your RV sink drains well, but the tank is full. Follow the same instructions as above, except don’t drain the water into the sink. Both sides should be plugged. When emptying is needed, siphon the water out with a jug and pour it into a bucket. Follow proper safety methods for disposing of the grey water in the bucket. If there is any residue left in the sink that cannot be siphoned, use a towel to soak it up and dry and clean the towel as soon as possible. This method is basically the same as method two, except you’re going to use bins to do the washing into so that as little as possible gets into the actual RV sink. This is best for when you either don’t want to siphon out water or don't want to risk getting too much water into the actual sink. So, you have a fridge in your RV or camper but you’re boondocking and can’t turn it on or it’s broken. Here’s how to use a turned off or non-working RV refrigerator as a cooler for food, drinks, or both. You can use your makeshift RV or camper trailer refrigerator cooler for drinks, refrigerated food, or both. The first step is to place a freezer pack into each storage container. Then, fill them with ice. Place the covers onto the shelves and then place the containers on top of the covers. The containers need to stay open to keep the refrigerator cool enough. Placing them on top of the covers helps eliminate dripping when the ice melts and helps keep them in place when your RV moves. Once the containers and food are in place for each shelf, use the RV refrigerator bars to secure everything so that it doesn’t move too much while driving. 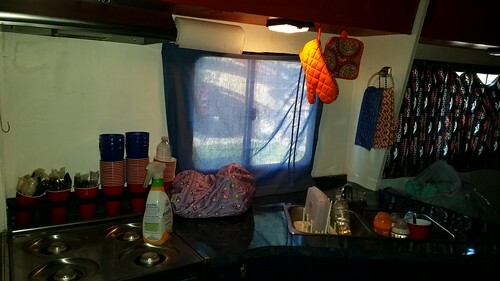 These bars are inexpensive and will save you from having food crash against the door and either get smashed, spilled, or cause the refrigerator to open while the camper is moving. Once your shelves are stocked and secure, place a freezer pack in each refrigerator drawer and then fill about halfway with ice. The space left over is where you will place the food that needs to go into the drawers. Freezer bags and storage containers help prevent your food from getting wet, just like in a traditional cooler. Refill your ice as needed to keep the RV refrigerator cooler at an optimal temperature. Using ice only works in a pinch, but the addition of freezer packs makes the ice last longer. If your refrigerator is larger, plan on replacing the ice more often. More food and drinks means more ice and freezer packs. Minimize how often the fridge is opened to help it stay cooler longer. Freezing the freezer packs beforehand makes everything last longer. Welcome to RV’ing Successfully! Whether you’re a full-time RV’er or traveling in it now and then, we have tips, adventures, and no-nos for you. This includes all types of motorhomes, campers, travel trailers, pop-ups, and the like. Let us make the mistakes so you don’t have to! We’re a little new at this, but studied hard beforehand and are learning so much along the way. Read about our start in “Beginning the RV Life - The BroncoBago” by my fellow writer and life partner, Richard Rowell. That’s just the start of a long journey and we plan to have tons of great resources, advice, projects, fun, adventures, and more for everyone living the RV life to enjoy.